A London designer makes sure one busy family gets equal parts style and function in their newly renovated home. 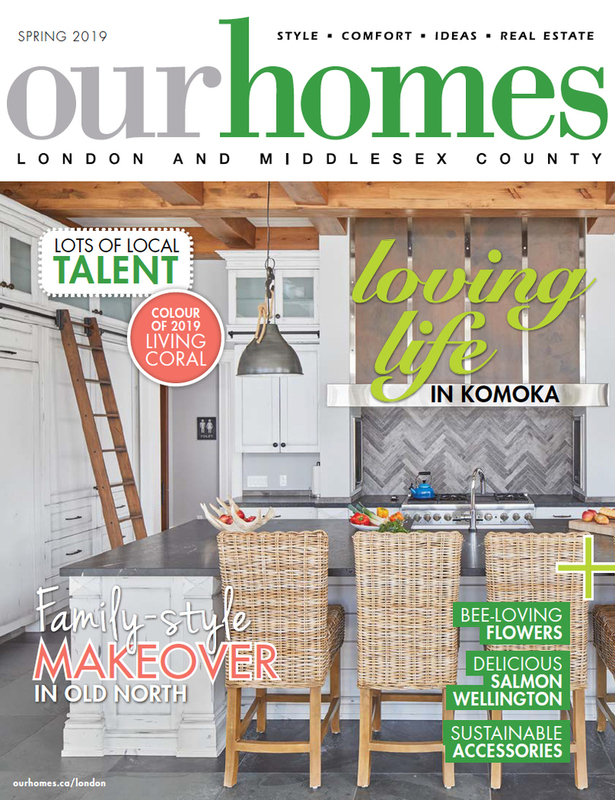 A version of this article originally appeared in the Spring 2019 issue of OUR HOMES London and Middlesex County, p.38. Find local businesses in our London directory. After 14 years in their Old North home, one London couple thought it might be time to move. The old-fashioned layout was no longer functional for a family with three growing boys and a large Bernedoodle dog. 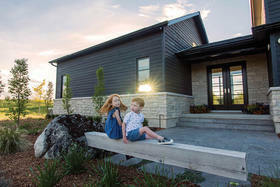 “It was a maze to get through to the family room. We were bumping into each other,” the homeowner says. In addition, the kitchen lacked ventilation and the floors on the main level were worn beyond repair. They decided to stay put and called in Laurie Battersby of Decor Resource for help. Her task? To transform the outdated kitchen, small dining room and a previous family room addition into a spacious great room while respecting the integrity of the century home. A new opening was created between the kitchen and the addition to facilitate the new open-concept layout. 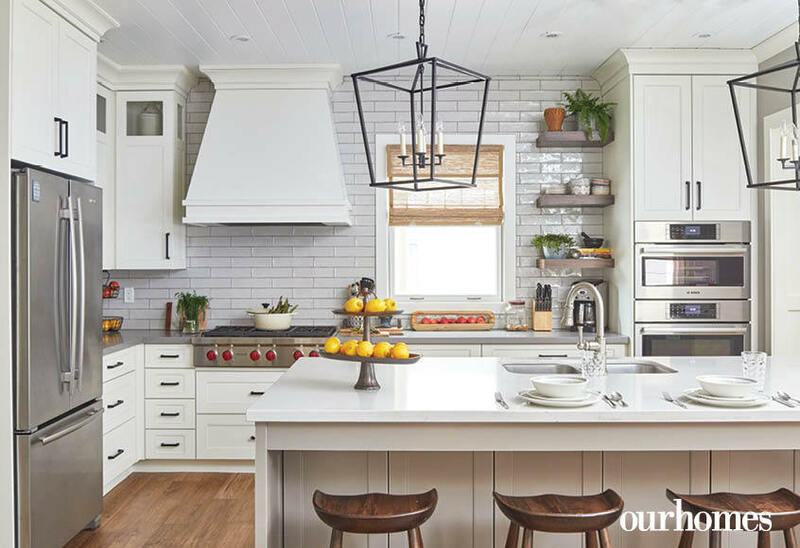 The family wanted to retain the family room’s stone fireplace and its surrounding built-in shelving, so Laurie used these elements as the inspiration for her kitchen design. 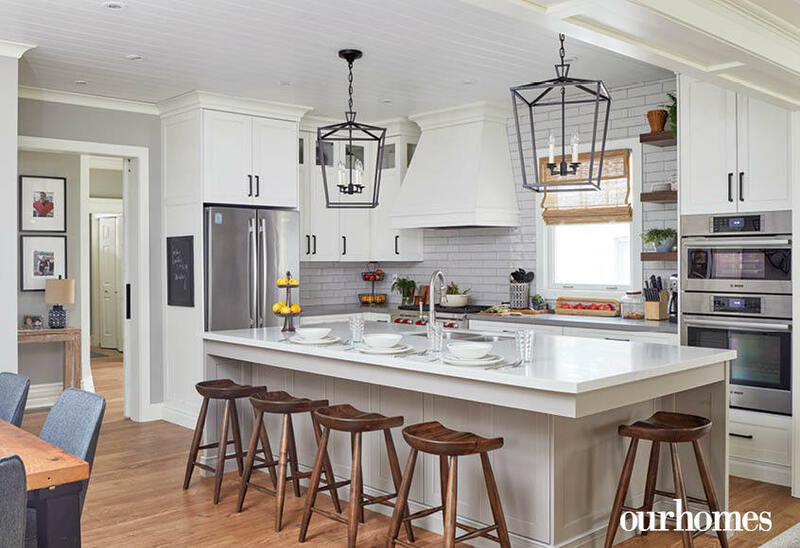 The kitchen cabinets feature a wear-through finish that creates a warm, vintage feel. 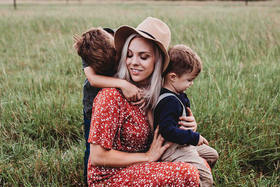 The slightly burnished look is a practical choice for a busy family, Laurie notes, as it hides fingerprints and is easy to clean. A custom oven hood provides much-needed ventilation for the six-burner Wolf range. A new sink from The Ensuite Bath & Kitchen Showroom and a subway tile backsplash complement the kitchen’s understated elegance. Laurie finished the kitchen/dining room ceiling with white tongue-and-groove panelling. 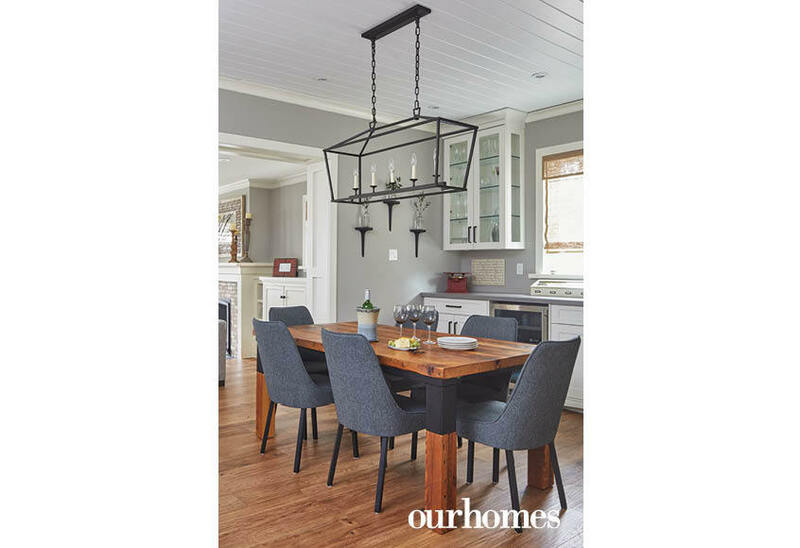 Sleek cast-iron pendulum lighting from Guildwood Lighting & Fireside provides the perfect finishing touch. Floors throughout the ground floor were replaced with engineered hickory and walls were painted Cosmopolitan by Benjamin Moore. 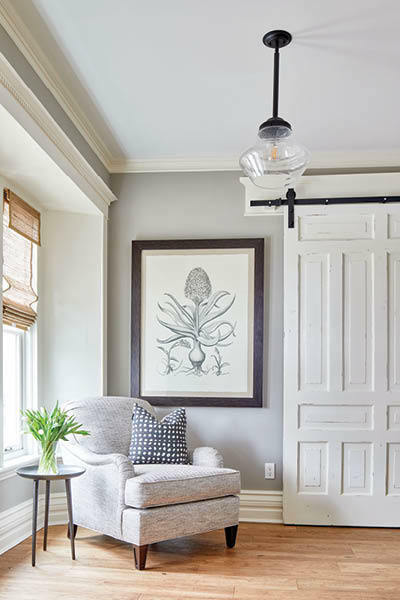 “This paint colour has a bit of warmth to it and works beautifully in an older house,” notes Laurie. A huge old door, hiding in the basement of the century home, was given a distressed-look finish and then hung as a slider between the front foyer and the kitchen. A comfy chair makes a pleasing nook in the bright and spacious entryway. Laurie Battersby of Decor Resource made close friends with family pooch, Murphy, during her work on the house. The music room opens from the front foyer. It doubles as a spot for quiet conversation away from family mayhem. 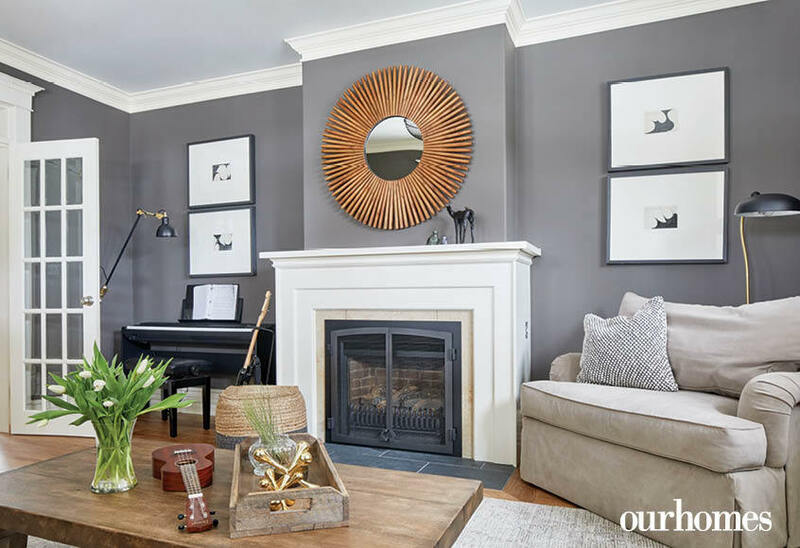 The front music room was refreshed with a stylish coat of Coachman’s Cape (Benjamin Moore). Simple black-and-white art and accessories quietly complement bold architectural features such as the windows and mouldings in this living room. 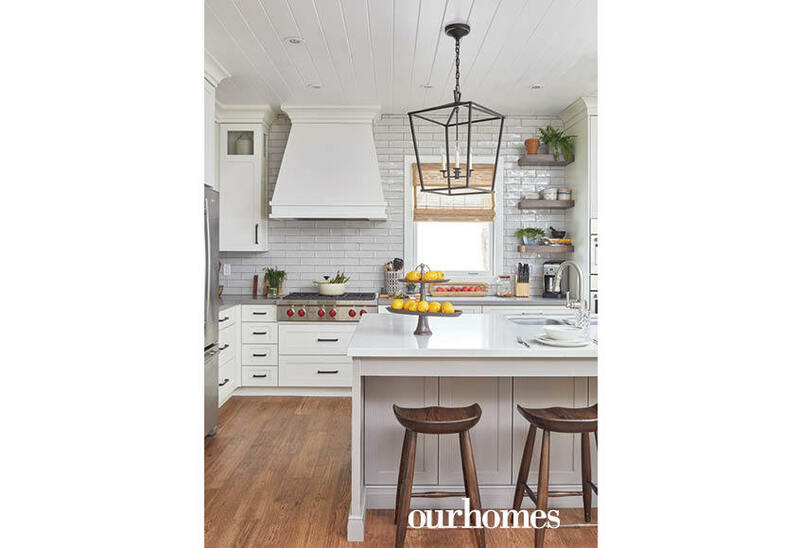 Extra storage space was created by the addition of a walk-in pantry, and in the clever design of a large centre island that features pull-out shelving on both sides. Topped with Caesarstone, the new island offers ample workspace and a comfortable spot for casual gatherings. The range’s red knobs add a playful pop of colour, while three floating walnut shelves located adjacent to the kitchen’s offset window provide additional visual interest. 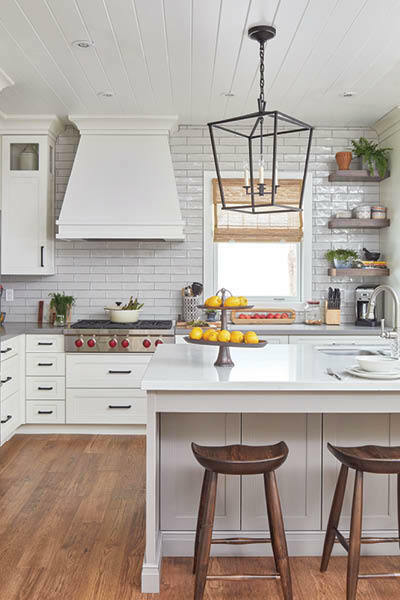 The new kitchen’s aesthetic befits the home’s vintage charm. 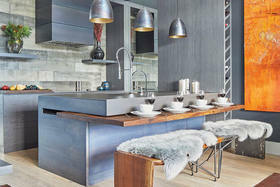 The custom range hood is one of many artistic details. Maintaining an area for sit-down meals was important to this family. 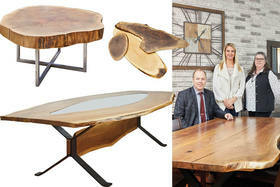 A reclaimed wood table anchors the dining space. A custom sideboard is tucked neatly against one wall. The room’s panelled ceiling adds to the home’s charm. The redesign started with the existing fireplace and surrounding builtins. Knocking down walls transformed the space into a sunny, inviting family room. A custom sectional and settee provides plenty of space for the entire family. 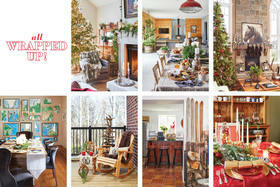 A dedicated office space was also on this family’s wish list. 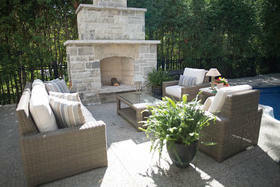 The family room addition was large enough to accommodate a custom desk as well as a comfortable sitting area. 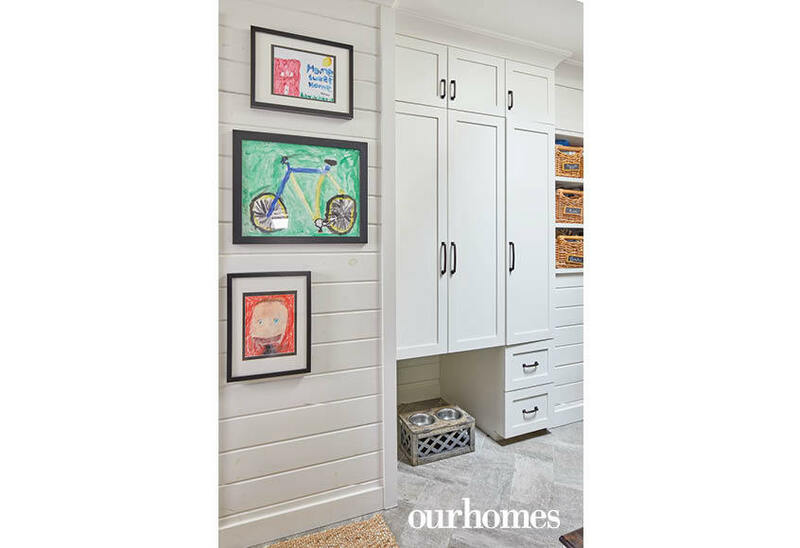 The renovated part of the house opens to the pre-existing mudroom, now decorated with the kids’ artwork.